Zederhaus is one of the bigger communities in the Lungau area of Salzburg. 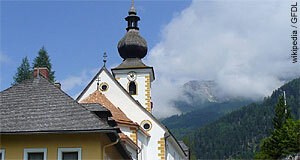 It has a total population of 1,200 and is situated in the West of the region, near the border to the Pongau area. Zederhaus is well-connected to the rest of Salzburg as it is located just off the Tauernautobahn, the main motorway for the Pongau/Lungau regions. Zederhaus already lies within a skiing area and can offer good access to skiing areas such as Flachau, Kleinarl or Obertauern. The valley in which the village can be found has the same name (Zederhaustal). Apart from skiing, Zederhaus has a few more things to offer. During the summer season, hiking and other Alpine sports are popular. There is a nature reserve called Naturpark Riedingtal with good hiking paths and some very scenic spots. Due to its relative accessibility and central location within the Lungau/Pongau area, Zederhaus also makes a good base for exploring hiking opportunities in the wider Lungau. This applies especially for the Radstädter Tauern, a mountain range. For a more immediate hike, note also the Mühlenweg Zederhaus, which will take you along creeks to ancient water mills. In terms of sightseeing, expect a typical Austrian mountain village with the usual array of Parish church (St. Johannes der Täufer or St. John the Baptist), farm houses, inns - and huge, modern 4-star-hotels. To develop a deeper understanding for traditional life in Zederhaus and its surroundings in the past, have a look at the listed farmhouse Denkmalhof Maurergut. Another big attraction of Zederhaus is seasonal: The Prangstangen. Similar to the neighbouring community of Muhr, enormous poles are arranged to hats and decorated with elaborate floral ornaments. They recall an incident with a grasshopper pest. The pole hats, which are carried to the local church by young men from the village in a procession, remain there until the flowers wither.